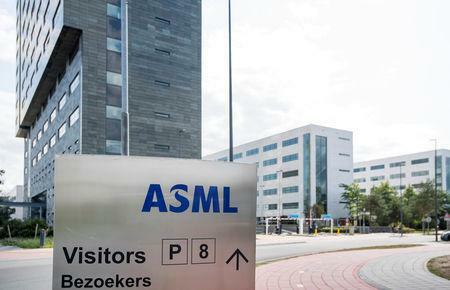 AMSTERDAM (Reuters) - ASML Holding NV on Wednesday reported a rise in third-quarter earnings that should ease scepticism over prospects for the semiconductor market, as it said demand for memory and logic chips remains healthy and it expects further growth in 2019. Net profit rose to 680 million euros ($786 million) from 557 million and topped the 671 million expected by analysts polled for Reuters. Sales rose to 2.78 billion euros from 2.45 billion. ASML is one of the largest suppliers to chipmakers including Samsung, Intel and TSMC, and is seen as a bellwether for the chip sector. ASML shares are up 6.8 percent year to date after closing at 155 euros on Tuesday. They are down 18 percent from a late July high, however, as chip equipment suppliers have fallen on fears of a slowdown in demand for memory chips. The company reported order intake of 2.2 billion euros in the quarter, with about 64 percent of that for its lithography systems destined for the manufacture of memory chips. "We see strength in both logic and in memory," CFO Roger Dassen said in a statement, with steady strength in demand for memory but increasing demand for logic chips, used as the brains of high-end electronics devices. He said the move toward a new cycle of smaller chips, known in the industry as the 7 nanometre generation, is behind logic demand. Dassen also said many customers were planning to upgrade or maximise the capacity of their existing systems, another important source of sales. The company is forecasting 3 billion euros in sales for the fourth quarter, which would mean a record high of more than 11 billion euros in full year sales. ASML foresees selling 18 of its company's most advanced lithography systems, which cost roughly 100 million euros each, in 2018 and another 30 in 2019.